Broken Wings is a story about forbidden love. Based on a poetic novel by Lebanese American poet Kahlil Gibran, this semi-autobiographical musical tells the story of a young Gibran, who returns to Beirut after 5 years away in America, and meets a local woman named Selma, the daughter of the rich Farris Karamy. The two young people fall in love at first sight, but Selma’s father arranges for his daughter to marry the nephew of powerful local Bishop. Duty bound, Selma reluctantly goes ahead with the marriage, leaving Gibran behind to stew in his loneliness, until the pair find a way to reconnect again in secret. Kahlil Gibran is one of the most successful writers of all time, and so the adaptation of his The Broken Wings for the stage makes perfect sense. With a book by Nadim Naaman and music and lyrics by Naaman and Dana Al Fardan, Broken Wings sees a 40 year old Gibran looking back with dismay on his younger years, and touches on issues of corruption, as well as women’s rights, all set against the backdrop of turn-of-the-century Lebanon. Broken Wings paints a warm, sepia toned picture of Beirut, bustling and welcoming, but stuck in its ways. In fact, the characters frequently remark to each other that nothing ever changes in the city, and those who have never left never challenge the status quo at all. A stark contrast to the life Gibran has led, straddled between two very different countries and cultures. The sumptuous strings of the onstage orchestra constantly reinforce the elysian atmosphere effused by the Beirut of Gibran’s memories, whilst his 40 year old self is scored with more ominous tones. Orchestrations by Joe Davison are utterly faultless throughout, subtle yet striking at every moment. 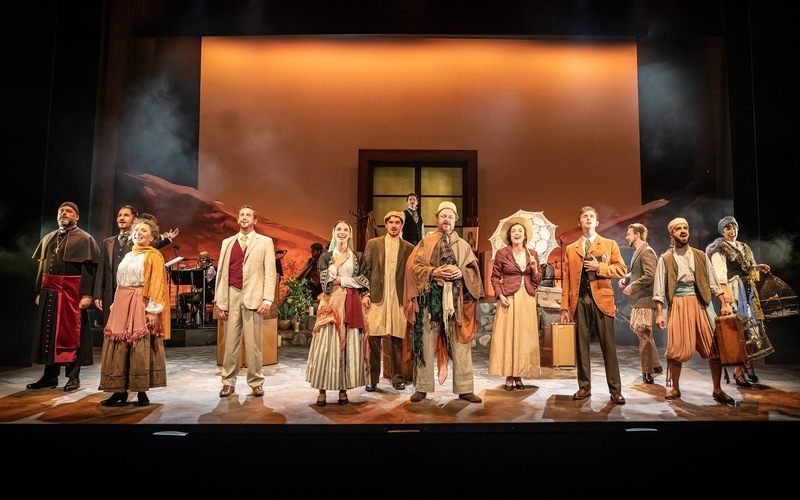 The show is also impeccably sung and acted, with Nadim Naaman taking on the role of Gibran aged 40, whilst Rob Houchen plays his younger self. Houchen breathes youthful exuberance into the young and naïve man, whilst Naaman is distinctly more haunted, grounded in a dark and shadowy solitude as he reminisces about his first and only love, his memories bathed in a soft and glowing sunlight. 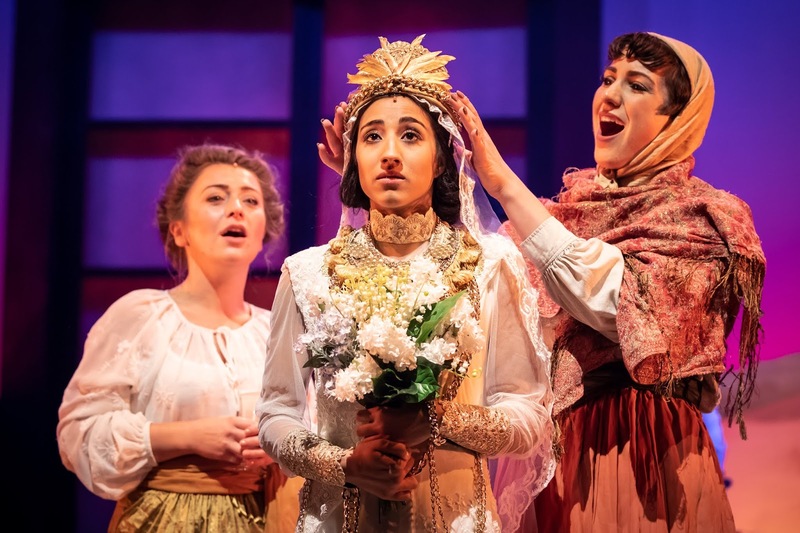 Making her West End debut, Nikita Johal is charming as soft spoken yet strong willed Selma, a woman ahead of her time, and the score gives her plenty of moments to shine, juxtaposing her quiet and patient exterior with the turbulent inner emotions which are revealed through song. In the supporting role of Karim, Gibran’s childhood friend, Nadeem Crowe brings a much needed comedic touch to the proceedings, giving a dynamic and endearing performance. Some of the most stirring moments in Broken Wings result from the songs, the most wrenching of which are the ensemble numbers, which lift Beirut off the stage and into the audience. That being said, Gibran and Selma’s love duets, whilst offering an insight into the demure couple’s inner feelings, are sometimes a little too syrupy and feel hyperbolic. Gibran’s frequent musical fawning sees Selma described using some beautifully evocative natural imagery, but it is used repetitively, lessening the effect of Gibran’s declarations. The script is also slightly stilted on some occasions, leading to a further disconnect between the characters. The love story is sweet and ultimately tragic, as the audience is told in Gibran’s opening monologue, and Rob Houchen and Nikita Johal sell their characters’ adoration of one another well, but the book affords them little time alone together, and as such their separation, which should feel like a knife though the heart, is rather more subdued. If the audience is to believe that Gibran is still in love with Selma over 20 years after her death, then the bond which ties the pair together in life should be that of an epic, all-consuming, butterfly-inducing romance. Of course, the traditions and expectations which they are confined to keep them from expressing their true feelings, and Broken Wings carries some strong messages regarding this, but it’d still be nice to feel a more fervent bond between the pair. Nevertheless, the book’s tonal peaks and dips, which take the story from celebratory to desolate and back again, keep the musical engaging throughout. Impressive in scale and soundly structured, Broken Wings is a haunting story which sheds light on important social issues which feel just as relevant today as when Gibran’s poetic novel was first published, back in 1912. 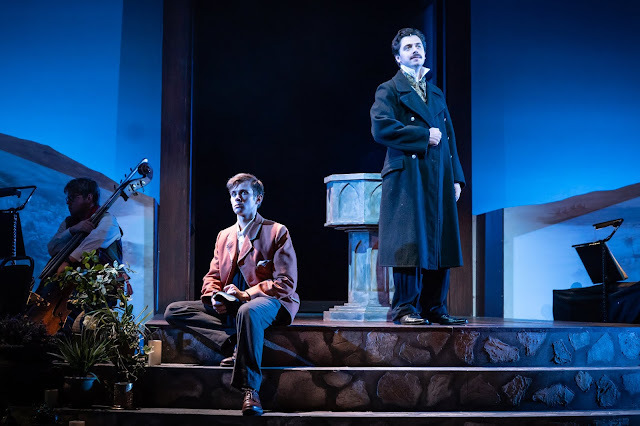 Admittedly, a more sweeping romance would have deepened the cutting sadness of the older Gibran’s remembrances, but even so, Broken Wings oozes delight and tragedy, with a finale which truly soars.